While screening for potential anti-inflammatory natural product scaffolds, alantolactone (1) was found to attenuate LPS-induced pro-inflammatory mediators in RAW264.7 macrophage cells. 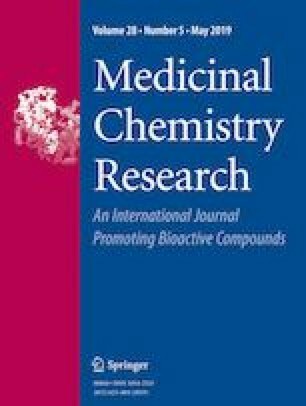 In this regard, a series of 17 novel thiol derivatives of 1 has been synthesized and evaluated as inhibitors of pro-inflammatory mediators viz. NO (nitric oxide), IL-6 (interleukin-6), and TNF-α (tumor necrosis factor-α) in LPS-treated RAW264.7 macrophage cells (In vitro) and female Balb/C mice (in vivo). In vitro, the best inhibition potencies were obtained with compounds 3, 4, 6, and 18, which were selected for further in vivo testing. The results of in vivo studies revealed that compounds 3, 6, and 18 are comparable to that of the parent molecule 1 on the inhibition of TNF-α and IL-6 release, whereas compound 4 was identified as the most potent inhibitor of cytokines IL-6 (69.49%) and TNF-α (66.12%) as compared with 1 at dose 10 mg/kg. Taken together, our results suggest that thiol analogs of 1 have therapeutic potential and could be further explored for potential anti-inflammatory activity. The online version of this article ( https://doi.org/10.1007/s00044-019-02337-1) contains supplementary material, which is available to authorized users. CK and AK acknowledge AcSIR for their enrollment in PhD program. We would like to acknowledge the Ministry of AYUSH (New Delhi) for providing financial support for the work of Y. K (Z.28015/229/2015-HCP EMR). The article bears the institutional manuscript no. IIIM/2281/2019. Gupta S, Khajuria V, Wani A, Nalli Y, Bhagat A, Ali A, Ahmed Z (2018) Murrayanine attenuates lipopolysaccharide-induced inflammation and protects mice from sepsis-associated organ failure. Basic Clin Pharmacol Toxicol. https://doi.org/10.1111/bcpt.13032.